"The exterior of this building is the most beautiful of any small church in Suffolk..."
roof, traditional East Anglian round tower and unique east wall. east wall as flushwork within the structure of the wall, is 16th century. 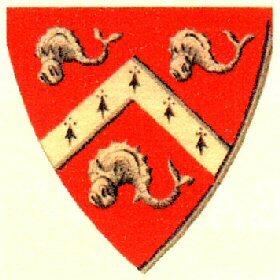 are striking representations of the Echingham arms, inverted. 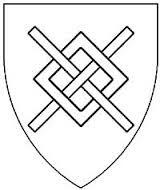 fretty (or fretté) as used in the Echingham coat-of-arms is a continuous fret or fretwork, forming a pattern diapering the field. F. Bedford Litho London Printed by Standridge & Co.
the younger (d.6-Oct-1415) on a ledger slab set into the floor at the north side of the sanctuary. "On the floor of the chancel lies the brass effigy of a warrior, in the military costume of the latter part of the fourteenth century. There are no armorial bearings attached to this monument, and the circumscription is lost, but it must, without doubt, have been placed to the memory of Sir Robert Atte Tye, who was buried here, soon after the year 1380; and whose widow, by will, proved in 1385, desires to be buried in Barsham church, by the side of her late husband. The costume strictly agrees with this appropriation. The present parish clerk, a very aged man, relates a tradition connected with this monument. He says, when this warrior died, four dozens of wine were drank, according to his last directions, over his grave, before the coffin was covered with earth. 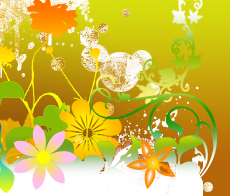 Strange as such a relation may sound to our ears, it is, in all probability, true. For in the will of James Cooke, of Sporle, in Norfolk, made in 1506, it is ordered, 'I will that myn executors, as sone as it may come to ther knouleg that I am dede, that they make a drynkyng for my soul to the value of vis, viiid, * in the church of Sporle.' The drynkyng was accordingly held in the middle aisle." John Blennerhassett (M.P. Suffolk 1566-71), son of Sir Thomas Blennerhassett of Loudham and Frenze, married c1535 Elizabeth Cornwallis of Brome Hall, Suffolk. 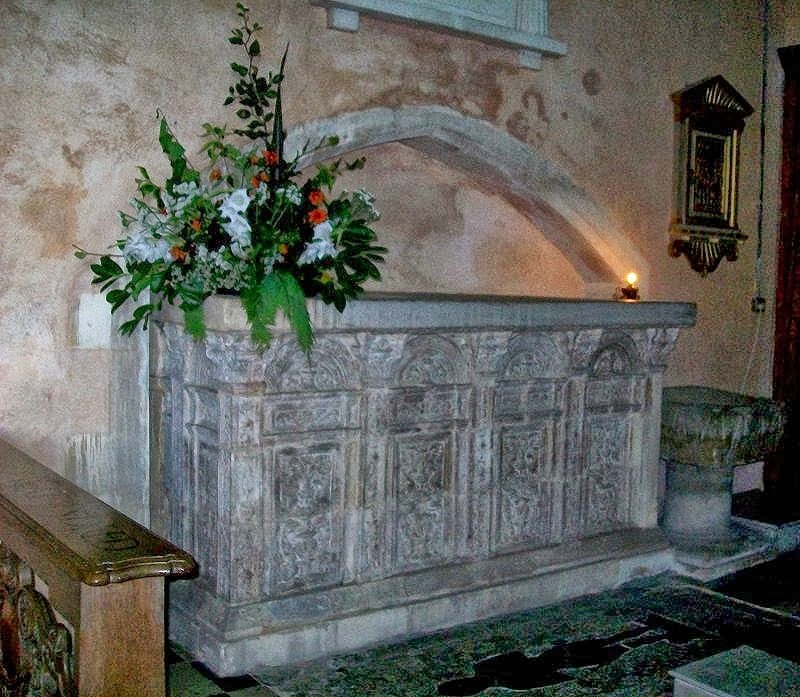 (he d.8-Jul-1527, interred in Barsham church). 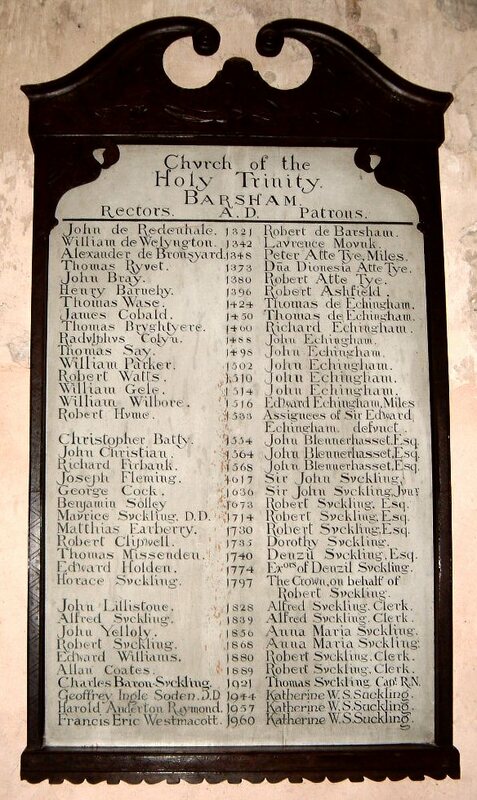 Following the Blennerhassetts as Lords of the Manor of Barsham, and thus as patrons of Barsham church, were the Suckling family. "The manors of Barsham and Shipmeadow were acquired in 1623 by Sir John Suckling, Secretary of State under James I and Charles I, and have been held by that family ever since. His son, Sir John Suckling, Poet Laureate, who inherited Roos Hall, housed a hundred yeomen for King Charles's Scottish war, at his own expense, in the great banqueting hall (now used as a barn), nr Barsham Hall Farmhouse"
"On the south side are three decorated windows. The central window was filled with stained glass in 1905 to commemorate the centenary of the battle of Trafalgar. This contains the armorial bearings of the family of the Rev. Maurice Suckling, Prebendary of Westminster [Abbey] and Rector of Barsham from 1714 to 1730. His wife was Anne. In 1725 their daughter Catherine, mother of Horatio Nelson, was born at Barsham Rectory; as was her brother Captain Maurice Suckling R.N. who gave Lord Nelson his introduction to the Navy and first lessons in seamanship." NOTE: James Primrose Blennerhassett R.N. (1785-68) of the Cumberland branch of the family was son of Lt James Blennerhassett R.N. and Isabella Primrose (c1765-1809). James joined the Royal Navy in 1800 and from Mar-1803 to Mar-1807 served as midshipman on board HMS "Tonnant" (80 guns + 10), on which ship he fought at Trafalgar under Captain Charles Tyler. Blennerhassett retired with rank of Commander in 1844. He was a Greenwich Hospital Pensioner 1844-1868. The manor house of Echynghams and Blennerhassetts, the medieval Barsham Hall described in the 1977 church guide booklet as "the great banqueting hall", was for many years in use as a barn for Barsham Hall Farm. Beautifully renovated and restored c1993 by the present owner, it is once again a fine house, known as "Barsham Old Hall", the restoration work earning a Civic Trust Award. 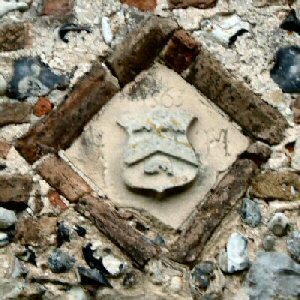 Set into the exterior wall over a door (now converted to a window) is a terracotta tile or brick displaying the Blennerhassett arms with initials I M (IOHN MARY) and date 1563. The initials are for John Blennerhasett and his wife Mary Echingham but the date is not their year of marriage - they married c1546. and recessed into the north wall, is the tomb of Sir Edward Echyngham of Barsham (b. bef. 1483, died 8-Jul-1527). WILLS: Sir Edward married twice - 1st to Mary Bedyngfeld who died in Ireland; 2nd to Anne Everard who died 14-Nov-1538 at Barsham. 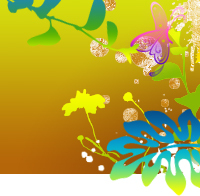 NOTE: A noncupative Will is an oral expression of a dying person's wishes, made before witnesses. 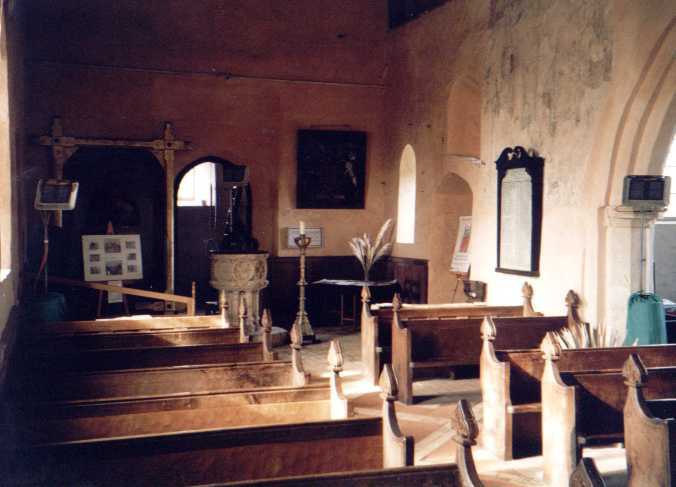 "An altar-tomb of richly moulded brick stands against the north wall of the chancel. It bears no inscription, but most likely covers the remains of Thomas Blennerhasset, Esq., who was buried in May, 1599". He was wrong to attribute the tomb to Sir Edward's grandson, Thomas Blennerhassett (b.c1546 d.1599), but in his defence he had believed the tomb to have no inscription, the partial inscription shown above not being found until the tomb was moved in 1869. The tomb is now recognised as being of a much earlier date than 1599, one of seven East Anglian "altar" or "table" tombs of similar style and material, all from Italy but with components made in Flanders during the 1520s (see above). In ["Some Notes on Barsham Juxta Beccles": "The Genealogist" v.23, 1907 pp.135-136] Florence Horatia Nelson Suckling recounts the circumstances of the 1869 discovery, inside the tomb, of "pieces of the inscription from the monument", these helping to confirm the occupant as Sir Edward. 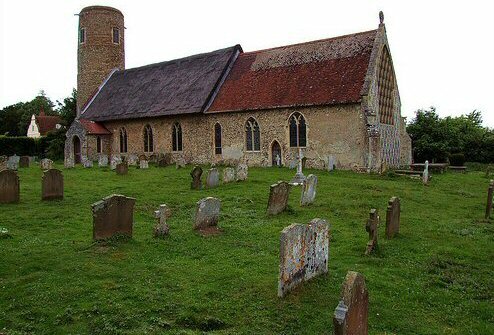 "Barsham Holy Trinity near Beccles - In the chancel a tomb of four bays stands out from the north wall into which the remainder of the chest was built in 1869. When it was taken to pieces to stow it in this way so that it would not project too far, fragments of early glass and pieces of the inscription from the monument were found inside. Just 'Hic jacet d'n's Ed' was legible, as recorded by Florence Horatia Suckling. The will of Sir Edward Echyngham, who died in 1527, mentioned a chapel of St Katherine on the north side of the chancel, and he wished to be buried under the foundations of the wall (presumably between chancel and chapel), so that, as at Barham, his chest tomb under an arch allowed communication between side and high altars. What remains is only part of the monument, for not only is the upper work gone, but the four-foot-high carved statues of his advower saints (including Katherine) have disappeared. He left a widow, Anne (who had to commission the tomb), and two young daughters, Anne and Mary, who became his coheiresses. Mary married a Blennerhassett, but Anne (1525-1600) eventually married Sir Owen Hopton of Yoxford, great nephew of Margaret, first wife of Sir Philip Bothe, and sister of his grandfather Sir George Hopton. This admittedly later event nevertheless shows what is likely in any case, that Echynghams and Hoptons were all members of the county set with Bothes and Bedingfields." 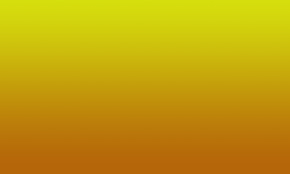 The top of a Christian altar is the mensa. In medieval churches the mensa was a large slab of stone placed on top of a wooden communion table, at which Mass was celebrated. Five small crosses engraved on the Mensa, one at each corner and one in the centre, symbolise the five wounds on the body of Christ. 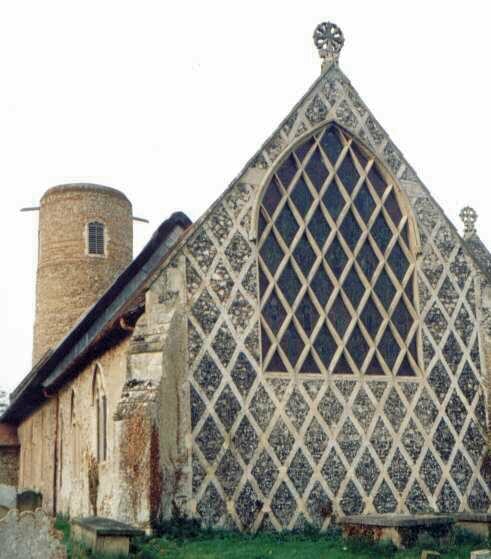 During the Protestant Reformation of 1529-1537 the mensa at Barsham was removed from use, to be rediscovered buried under the east wall of the church and reinstated as the altar in 1900. "The old stone mensa, or altar top, is of purbeck marble probably of the 13th cent. form[er]ly in one piece 8 feet by 3 feet by 5 inches thick with traces of its five consecration crosses. It was found buried [under the east wall] close to its present position by Rob[er]t Alfred John Suckling rector 1868-80, grandson of Alfred Inigo [Suckling], in 1868" ........ "Mr Coleman found an old altar stone with five crosses on it in the church here, very nicely cut - meaning thevfive wounds of our lord." ........ "Robert had the [oak] table made in the 1880s but it was not until 1900 that Allan Coates dared to bring the mensa back into use. 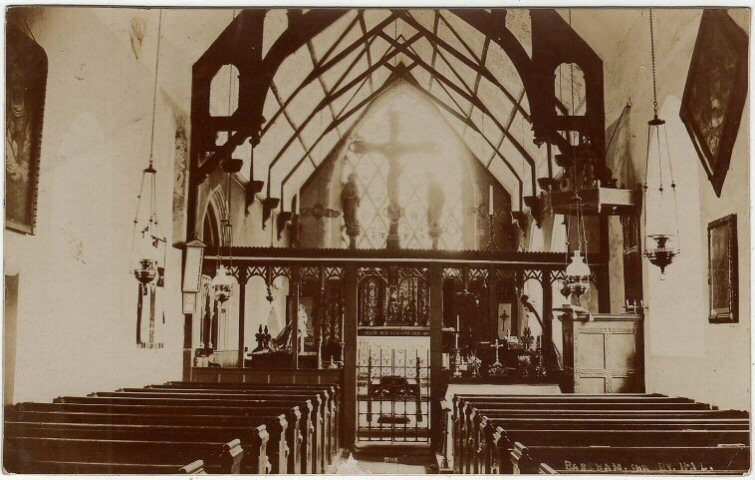 On the 8th February 1906 a frightful thunderstorm broke over Barsham, the lightening passed through the top of the East Window though little of the glass was broken many of the mullions were so badly damaged that the whole window had to be rebuilt. It also smashed the mensa into six pieces, some being hurled many feet away." NOTE: Another discarded medieval stone mensa, at Frenze in Norfolk, was discovered c1900 in use as a doorstep for the church. Reinstated as the altar of the church of St Andrew the Apostle at Frenze, this remains in occasional use. Davy's Blennerhassett family notes (37 pages) are [BL Add. Ms.19118 ff.348r-367v] this Ms. being summarised as "The Blennerhassetts of Kerry: Earlier English Stock” [BOK] by S.M. in “Kerry Archaeological Magazine”, v.5 No.21 July 1919 pp.34-39 [KAM]. ♦ "Notes, Letters & Sketches concerning Barsham Hall, compiled 1915/1919": Farrer-Harris Antiquarian Collection at Suffolk Record Office Ipswich [SRO HD78:1671]. ♦ Barsham photographs by Edmund Lovell taken between 1914 and 1929: Lovell Photographic Collection at Suffolk Record Office Ipswich [SRO JI 11/1/ pp.34,35,36]. ♦ "East Anglia's Story: Studies in Honour of Norman Scarfe" 2002. 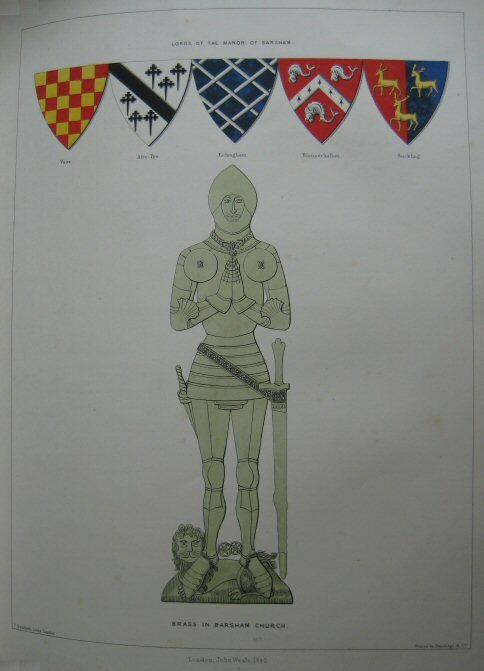 Paper titled "Sir Philip Bothe of Shrubland: The Last of a Distinguished Line Builds in Commemoration" by John Blatchly and Judith Middleton-Stewart, contains on pp137-138 an item titled "Barsham Holy Trinity near Beccles". 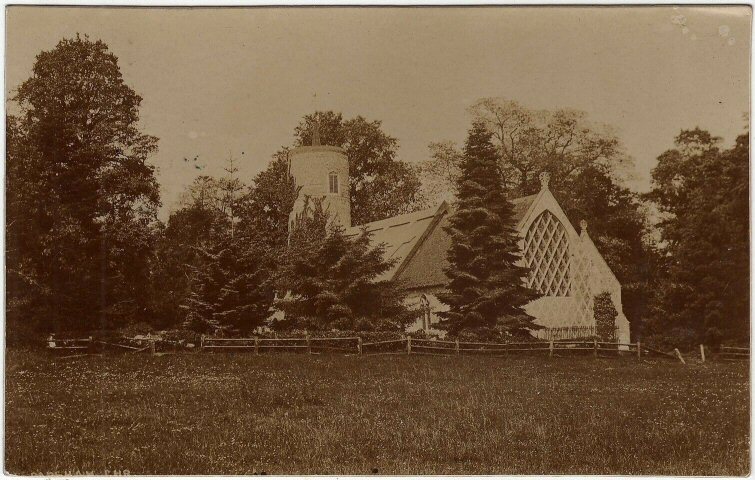 "The Church of the Most Holy Trinity, Barsham with Shipmeadow, Beccles, Suffolk"